Low employee engagement represents a major challenge for various organizations. It is essential that businesses engage with their staff to keep their workforce motivated and productive since the poor employee engagement can lead to a company’s downfall. A 2012 report states that companies around the globe are spending $720 million USD a year on improving their engagement levels. Yet, another Gallup report highlights that only 30% of employees are actively engaged. Other reports stated that disengaged employees cost the American economy $350 billion a year. There is the misconception that engagement is driven primarily by good or bad management. Nowadays, employees are in fact looking for a sense of purpose in their jobs, a feeling that they’re part of something bigger. Recent research suggests that this feeling is not just empty speculation. Therefore, realigning employment engagement becomes a business imperative. To do so, it is important to understand what the challenges are and ultimately find solutions to solve them. Nowadays, employees are expected to put 120 % of the time devoted to their careers. It comes as no surprise that they become complacent and agitated when the opportunity for professional growth lacks. In fact, a recent survey found that when employees lack this opportunity it contributes to low engagement and high employee turnover. What employees want is to improve their skills and broaden their knowledge. At the end of the day, the recognition of professional development is a huge motivational factor. An innovative and engaging corporate training can solve such issues. The key is to create an environment where employees are inspired and encouraged to succeed. Through its application based e-learning solutions, Procurement Academy and Sales Academy have the objective to turn their employees into leaders by increasing productivity and employee engagement. In fact, research has shown that companies with highly engaged employees, produce shareholder returns of 9.3 percent higher than the S&P 500. The main concern of business leaders is to increase productivity, output, and innovation. However, they should understand that it is difficult to make this happen when employees are not on the same page. In fact, when employees feel they are not fully committed and enthusiastic about their work, it’s up to the manager to understand why this is so. Hence, a superior approach would be to understand what motivates and drives employees in the workplace. Having a broad understanding of the factors that increase productivity, that motivates employees to perform, and that increase the efficiencies in the workforce, managers will be able to enjoy better levels of engagement. Therefore, having leaders who inject life into the organization is vital to the ongoing success of the company, and managers who have the ability to inspire their employees generally enjoy happier employees. Companies focus on the bottom line, not employees. Employee engagement is likely to occur when employees know what to do, and when they want to do it. In fact, the engagement process is a partnership, whereby employees and leaders must mutually engage to grow the business. Hence, organizations need to look further than the bottom line and engage with employees to get the most out of their productivity. Employees should be considered as the main asset of any business. Having a successful organization requires a bit more than just focusing on making a profit. Not having actively engaged employees can have detrimental effects on the organization. Therefore, companies make engagement happen by fully aligning the business strategy with the talent strategy. It is essential for managers understand where they stand with their employees. Through such feedbacks, leaders can understand how their subordinates see them, and where they can improve. Hence, by soliciting manager feedback conversations, it ensures that employee engagement remains high, as employees have the freedom to express exactly how they see the manager and where they fall short. Hence, the key to addressing the concerns of employee engagement is through communication, and by constantly asking, companies can solve engagement issues before they hinder the company’s success. One of the most effective methods to increase employee engagement is through training. Without good training and development opportunities, employees’ performance can be negatively impacted: 23% of employees leave their jobs due to the lack of training and development opportunities and 58% of staffs feel that they are not reaching their full potential due to the lack of skills and relevant qualifications. Therefore, training comes as a valuable means to resolve such situations. Today, with advanced technologies, new forms of e-learning such as scenario-based videos, webinar, simulation, and gamification are increasingly being implemented and used by global corporations. For instance, companies who use online training technology achieve 18% boost in employee engagement. Acknowledging the accomplishment of employees will lead a boost in motivation. This will allow the staff to give their best in their jobs. Hence, resulting in better employee engagement within the organization. Therefore, employers will benefit from increased productivity and profitability as employees will feel that their efforts are being appreciated. 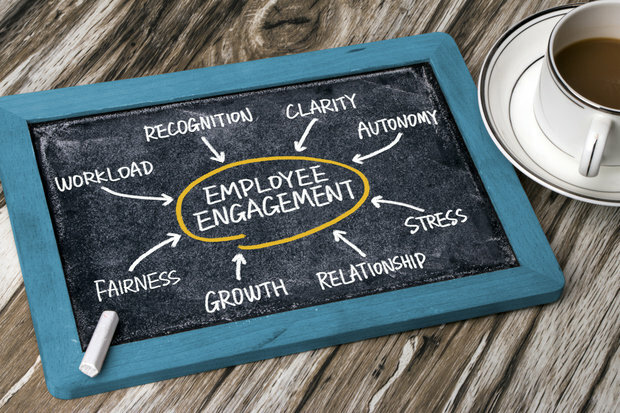 It is certain that employee engagement is critical to business leaders seeking to attain high scores in key performance indicators and inspire their workforce to attain significant business objectives. To reach these goals, the challenges need to be considered and solutions need to be applied. It has been proven that training and development is one of the most effective ways to boost employee engagement. Indeed, highly engaged workers lead to better business outputs, loyal customers, and better financial performance.